What followed was the first ever test of hashtagability of a word or a phrase. Messina wanted to come up with a hashtag that would become widely adopted (‘I wanted to apply hashtags as a mechanism for bringing people together around a common term’). In order to do that, he checked Flickr’s Hot Tags to see what tags people were already using to describe the fires. 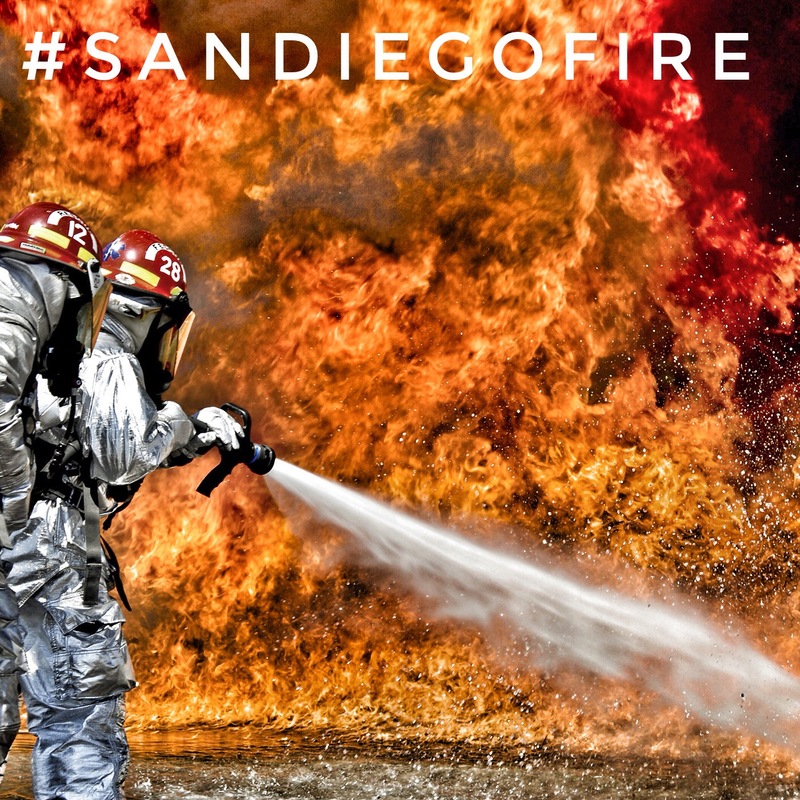 Figure 3 shows how he managed to identify the most hashtagable phrase – sandiegofire using Flickr. ‘Sandiegofire’ was neither the most popular nor obvious word to become a hashtag. 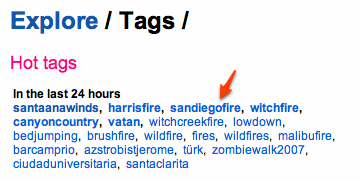 Flickr’s Hot Tags contained at least another 9 words or phrases (santaanawinds, harrisfire, witchfire, witchcreekfire, brushfire, wildfire, fires, wildfires or malibufire ) that could have become hashtags. 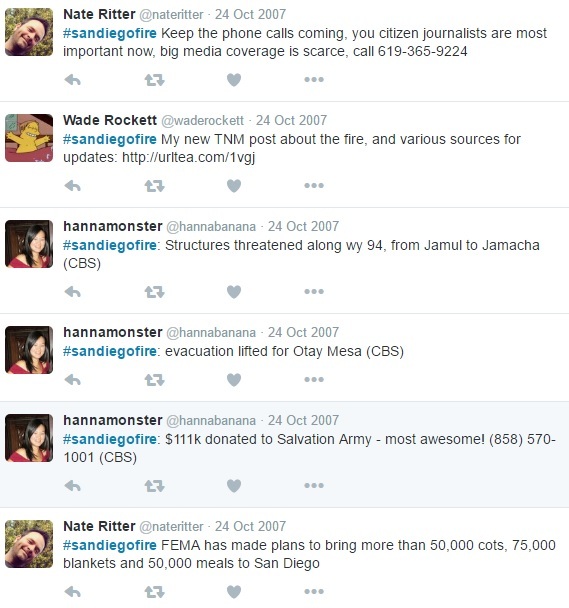 The decision to use sandiegofire was most likely caused by the fact that Ritter was already using ‘San Diego Fires’ to identify his content and although it was not the most popular hashtag on Flickr, Messina thought it ‘had the best chance to be widely adopted, and that would also be recognizable in a stream of updates’ (Messina, 2007). Messina then contacted Ritter with his suggestion and after a few hours Ritter started using the hashtag #sandiegofire (Figure 4) in his broadcast as the first hashtag ever to come into existence after performing the hashtagability test (by checking Flickr tags). After another 25 Tweets from Ritter and 5hrs after the first use of #sandiegofire, user @dabloguiman provided information about #sandiegofire hashtag in Spanish language (Figure 7). Gradually more and more people started using #sandiegofire and it became a big breakthrough in the history of the hashtag. It was Nate Ritter who initially posted the vast majority of Tweets with #sandiegofire hashtag, but very soon others started joining in in large numbers. One day after their initial use, there were more and more people joining in and the hashtag became more multiuser (Figure 8). In terms of the way #sandiegofire was used, some differences started emerging. Most people used it to talk about the actual event – some of them copied what Ritter did (@hannabanana) and focused on providing ‘news-style’ Tweets. Others used #sandiegofire to promote their blog posts (@waderockett). The San Diego fires stopped after few days and the #sandiegofire hashtag become less active for a while. It is being continuously reactivated during anniversaries of the 2007 events and every time when fire happens again in San Diego. There is also an ongoing discussion on the #sandiegofire broadcast about #sandiegofire as the first successful use of hashtags. Piatek, S. J. (2016) '#sandiegofire – the first successful example of hashtag in news context' in Paper Raf [Online] Available at: https://paperraft.com/2016/09/03/sandiegofire-the-first-successful-example-of-hashtag-in-news-context/ [Accessed: [Enter date].